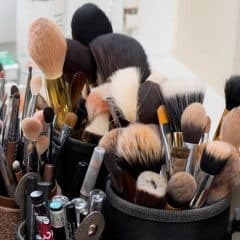 Most women use and clean makeup brushes at least four or five days a week if not more. Even those who do not apply makeup often, do so occasionally. In order to ensure our makeup is applied smoothly and our faces are clean, you must regularly clean your makeup supplies and clean them well. Luckily, it is not too difficult to clean makeup brushes at home, but it does require a few specific ingredients. 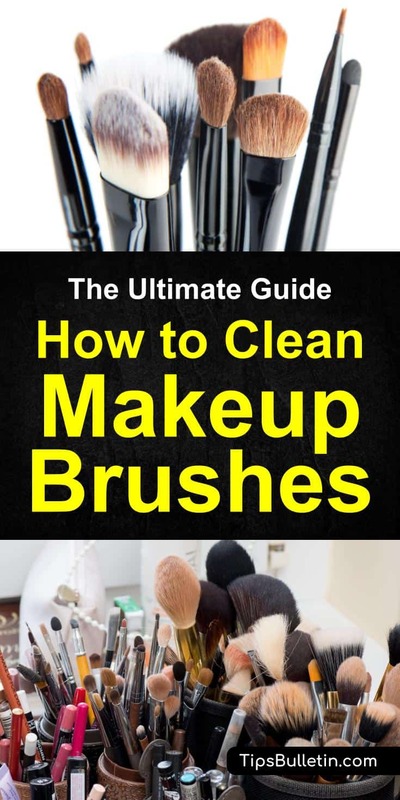 Beauty experts suggest thoroughly cleaning your makeup brushes once a week. If your brushes get heavily soiled you may want to clean them more frequently. 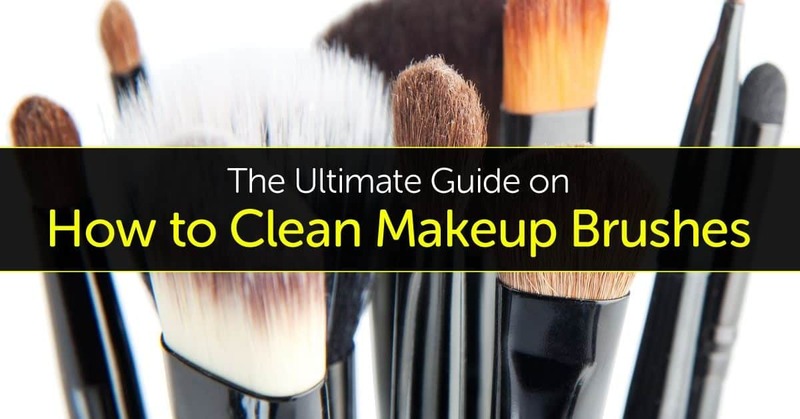 Likewise, if you rarely use makeup, you can usually get away with cleaning less often. Use your judgement, and try to clean them before they get heavily dirty. Mix the baby shampoo and water in the small bowl and set aside. You will want to rinse the brushes under luke-warm tap water before you do anything else. Similar to when you clean hair brushes, run your fingers along the tip of the bristles to spread them so you can get as much of the excess makeup off the brush as possible. Don’t work your fingers where the bristles meet the handle to avoid inadvertently loosening the glue that holds the two pieces together. Now, dip the bristles into the bowl of shampoo and water. Swirl it around and use your fingers to work up a lather. After the brush looks clean, you can rinse it under tap water. Make sure the water is running clean from the brush. If it’s not, put it in the bowl of shampoo water again and repeat the process. To dry the brush, pat the bristles with your cloth. Then wrap the cloth around the bristles and gently squeeze to remove excess water. Afterward, lay the brush on a flat surface to dry, but remember to reshape the bristles when it’s wet. If bristles dry skewed oddly, it will be difficult to get them back in order. 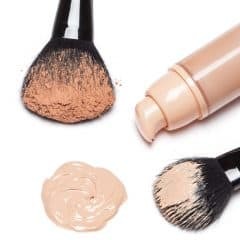 Cream-based makeups are more difficult to clean from brushes than powder-based makeups, so using just baby shampoo and water is unlikely to get all that makeup off easily. to wash brushes for cream-based makeup. Put a small amount of oil on the towel and dip the bristles of your brush into it, swirling to coat, but do not soak the brush in oil. Use the towel to gently wipe the brush, running the brush along the paper towel. For an even more gently wipe off the makeup brush use a special silica scrubber board. This will help loosen the makeup before washing. Rinse the brush in lukewarm water in the sink. Then, place a small amount of baby shampoo in your hand and swirl the brush around in it, creating a lather. Afterward, rinse the brush again, until the water runs clean. If the water is still dirty, you can wash the brushes with baby shampoo a second time. After the brush is clean, squeeze the excess water from it with the cloth and pat dry. Then leave the brush on a flat surface to dry completely. Remember not to store wet brushes vertically as the water can leak into the handle causing bacteria and possibly rusting the metal. Once dry, brushes can be stored upright or flat in a case. Never store your brushes with the handle up, however, as this will damage the bristles. In addition to a regular washing, you can also help keep your brush cleaner by using a cleansing spray or shampoo specifically designed for makeup brushes. You just spray your brush after every use. The spray is no substitute for regular, thorough cleanings, however. 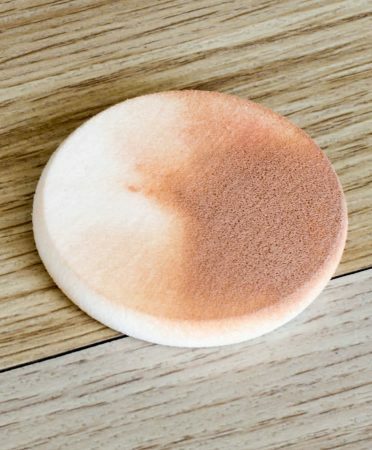 If you use makeup sponges, odds are they probably need to be cleaned. Sponges should technically be cleaned after every use, though you can get away with cleaning them less often. Cleaning makeup sponges is fairly easy if you use a product, like Blendercleanser, to clean them. If you aren’t going to clean after every use, just soak your sponges in soapy water to help break up the old foundation. Then, squeeze out the water and spot clean any stubborn spots. Afterward, you can air dry the sponge. Simple. And remember makeup sponges are good for about three months.